(DEGREES THAT IS) Ventura Golf – Play in the 70s! Be a resident for the day! Play for city rates – up to 25% OFF public rates! 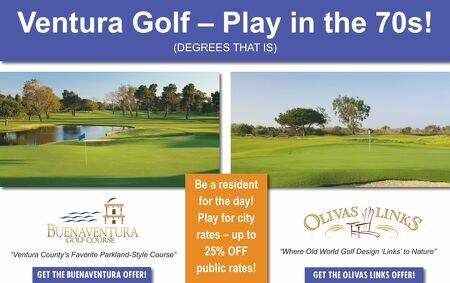 "Ventura County's Favorite Parkland-Style Course" "Where Old World Golf Design 'Links' to Nature" GET THE OLIVAS LINKS OFFER! GET THE BUENAVENTURA OFFER!